Please us for this year’s AGM Brunch at Symposium Cafe Restaurant & Lounge North York, February 10, 2019 at 12pm. Order breakfast, lunch or dinner items from their extensive menu which caters to every taste and every budget. This year we’re keeping it simple, pay for what you order! Invite your sisters and enjoy and afternoon reminiscing and planning for our future. RSVP to ashley.pivko@gmail.com by February 1, 2019. LOOKING FORWARD TO SEEING YOU! We will be collecting gift cards and toiletries for Juliette’s place at the AGM. Juliette’s Place (Homeward Family Shelter) provides safe, short-term emergency shelter to women and children fleeing violence and abuse and helps them to build their skills through educational programs and support services. We will also be holding a raffle in support of the Dorothy Cody Fund hope you are feeling lucky! The Establishment of Canada Alpha and Early Residence History. In 1927, a group of women at the University of Toronto formed a local sorority called Kappa Phi Alpha. In 1929, the women of this same sorority applied to Delta Delta Delta for a charter, and this request was granted. The Canada Alpha Chapter was officially installed on May 24, 1930, and there were 28 Charter members, most of whom were students enrolled at University College. The initiation banquet was held at the Royal York Hotel that evening. 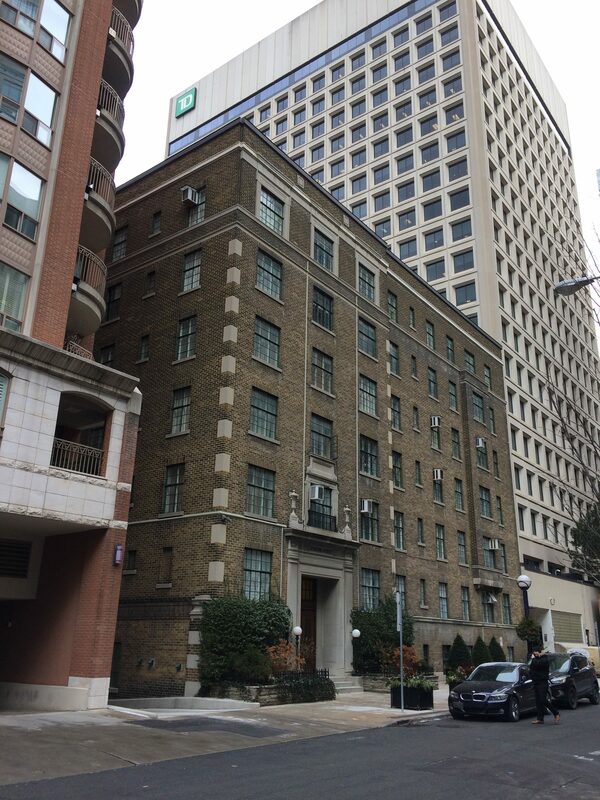 At that time, the Chapter occupied an apartment at 2 Sultan Court (now 2 Sultan Street, see photo), just east of the Windsor Arms Hotel. In subsequent years, the Chapter moved around several times, first to other apartment buildings, among them 321 Bloor West (the original building is no longer extant; the Woodsworth College Residence stands on that site now), and then to different houses along St. George St. (first 85 St. George in 1933; then 122 St. George in 1939; and then 136 St. George in 1948.) In 1966, the University of Toronto identified that block on the west side of St. George as the ideal site for the new Robarts Library, and the Chapter had to vacate the property and find a new home. 30 Madison Avenue was identified as an ideal new home for the Chapter. We invite you to join us for this year’s AGM Brunch at Symposium Cafe Restaurant & Lounge North York, February 10, 2019 at 12pm. We welcome you to order breakfast, lunch or dinner items from their extensive menu which caters to every taste and every budget. This year we’re keeping it simple, pay for what you order! Please RSVP to ashley.pivko@gmail.com by February 1, 2019. 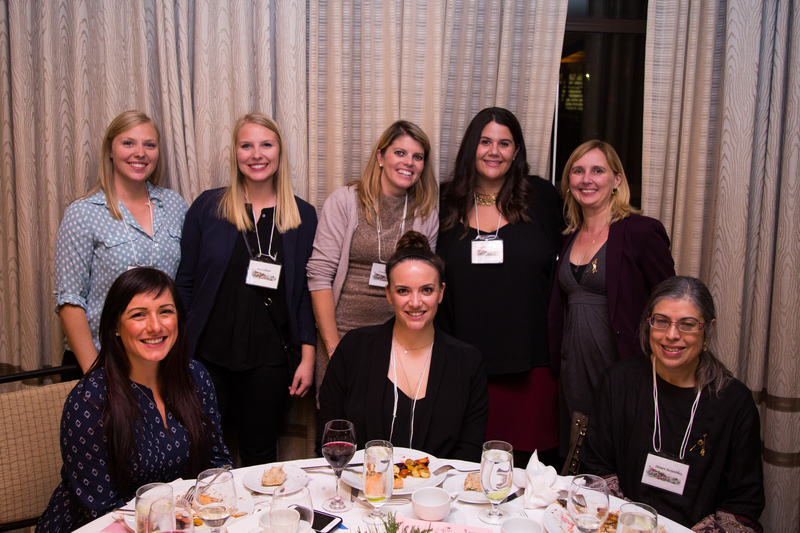 On behalf of the Toronto Alumnae Executive Committee – we want to extend our warmest wishes during this holiday season, and all the best in the New Year! Do your nails need some refreshing before the holidays? Well now is your chance! DDD Holiday Nail Night is on Monday Dec 10th, from 5:00 – 7:30 p.m. Drinks and snacks will be provided!! Send an email to krystal.mercer@hotmail.com with your time preference and mani and pedi request so I can book your appointment 🙂 Hurry, spots are filling quickly! Wednesday, November 21st. Please RSVP by providing payment below. Be sure to choose your meal selection using the dropdown menu. Over the last few years, National Novel Writing Month aka NaNoWriMo has become huge. It’s a great way for anyone to express their creative side or for writers to finally get that novel written and finished. I’m always delighted when I discover someone I know is doing NaNoWriMo. Are you novelling this year? Please say Hi and become my buddy at ShireenJ! A friend introduced me to it in 2009, and I’ve written a novel or non-fiction every year, though most remain unpublished. This year, I set myself the challenge to both write and edit for public consumption a satirical novel focusing on every Torontonian’s favourite subject. No, not raccoons. The TTC. Louise and The Men Of Transit. Please join us to celebrate 130 years of Delta Delta Delta! The cocktail reception starts at 6:00 pm with dinner being served at 7:00pm. As usual there will be the presentation of awards, speeches and the silent auction to enjoy throughout the evening. Tickets are $70 for dues paying alumnae and $90 for non-dues paying members get your tickets here: http://torontotridelta.ca/dues-and-payments/. We ask that you buy your tickets and select your menu option by November 13th (please make us aware of any dietary requirements prior to the evening). Looking forward, as always, to seeing you there! Honey Garlic BBQ Chicken with rice and vegetables. Vegetarian option: Mediterranean grilled vegetable ravioli with smoked tomato sauce. TTC – St. George and Bay Street subway stations just a short walk away. Parking – Green P lot on Bedford Road, just behind the hotel.